You have just purchased a brand new Galaxy S7 and this is one of the best smartphones currently in the Android world. This phone comes with the most advanced features that include: 1.6GHz octa-core CPU and it comes with 4GB of RAM. This is probably the most powerful phone that you have ever used in your life. Using this smart phone is definitely a whole new experience. But now the only thing which is almost getting on your nerve is the contact transfer. You have been using your Sony phone for a long time and you have all your contacts stored in your old Sony phone. Transferring each contact manually is definitely a super time-consuming job and this is not a viable option at all. 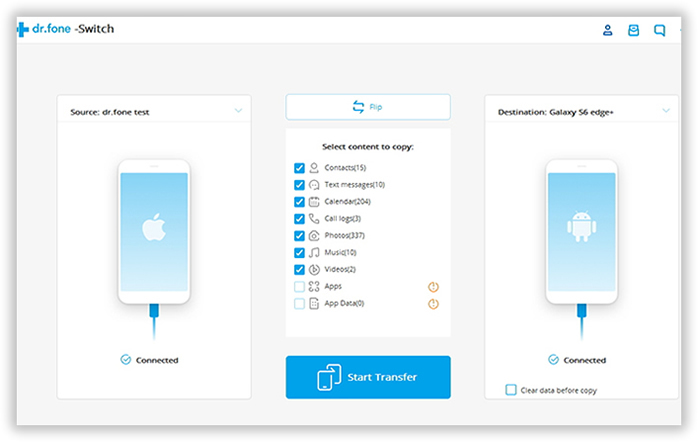 The truth is that all you need is an efficient third party software, which lets you to transfer all the contacts between two phones within a few minutes as well as other data such as text messages or photos. File Type: Contacts, Text Messages, Photos, Music, Videos, Call Log and Documents. Sony Xperia Phone : Xperia X Performance/XZ/XA, Xperia Z5/Z5 Compact, Xperia Z3/Z3 Compact, Xperia C4/M4/E4/Z4/Z1, Xperia X/XA/T4/TL and others. Samsung Android Phone:Galaxy S9/S8/S7/S7/S5, Galaxy Note 8/Note 7/Note 5 and other more. You can simply download the software from this site. Once the download process is completed, you need to install the software. Finally launch it when the installation is done. You will get to see the main users interface of the software at the end of installation. The interface is very simple and anyone can understand it. Click "Switch" to enter into next step. Insert Xperia Z3 and Galaxy S7 into the same computer with USB cable. A few seconds later, you can see both phones are shown on the main window. You will find the source device on the left side and destination device on the right side. Plus, you can change the sides by clicking "Flip" button. It will change the position of the two phones. Once the phones are connected well, you will see all the transferable data listed between two phones, such as contacts, sms or music. Now you have to simply select the "contacts" option and click "Start Transfer " button. Once you get all the contacts transferred to your Samsung Galaxy S9, you need to click "OK" to finish the procedure. The entire procedure is super simple and easy so that anyone can use this software without facing any sort of difficulty. This software also supports app data transfer between two Android phones and the best part of this software is that it ensures all selected data is transferred in a very safe and secure manner. 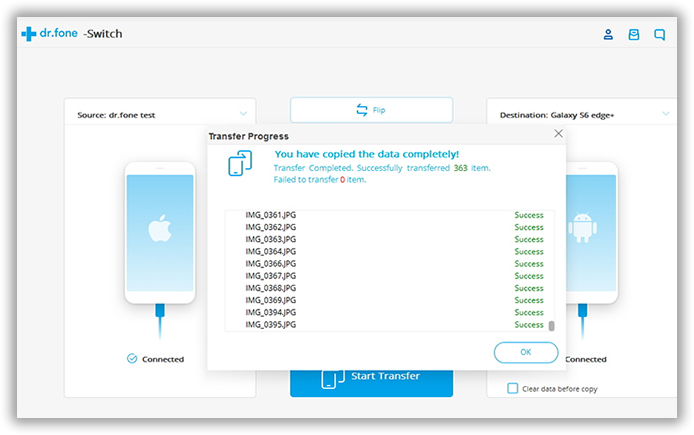 In addition to data transfer, you can also use Phone Transfer to backup phone data. This is one of the useful functions to ensure the security of private data. 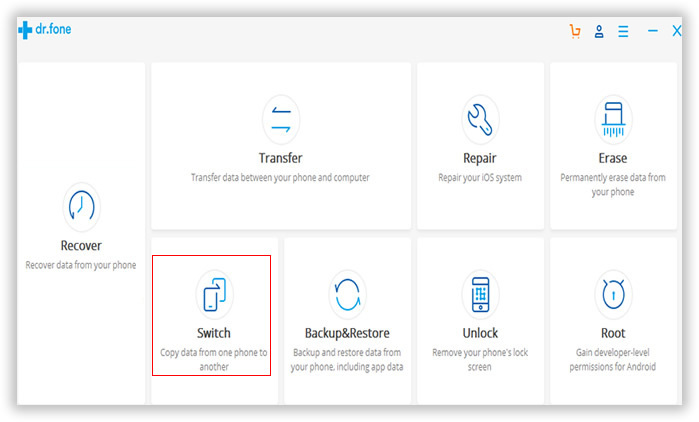 Once you lost data, you can restore it immediately from previous backups.